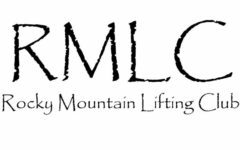 Rolling into the new year we have big changes at RMLC. -A new location that is almost double the size with all of your favorite equipment out of storage. -A new website to keep everyone up on all the happenings at RMLC. Please contact us directly for all of your competition needs. We can help with detailed training cycles and day of meet preparation. Stay tuned as programs are added and the website changes.